This chic boho and romantic bracelet is very delicate and refined. Its oval shape fits the wrist. 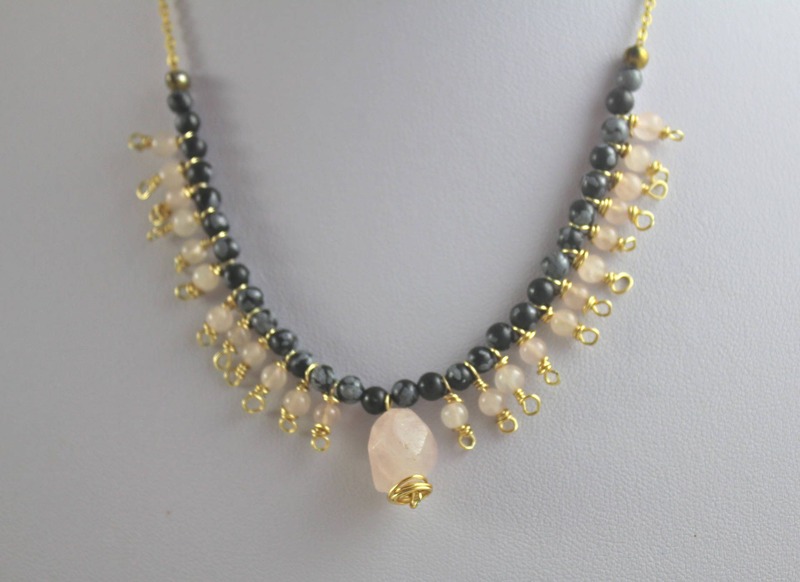 It is composed of beautiful rose quartz and snowflake Obsidian beads. This bracelet perfectly matches the necklace from the same style and shape with a very pretty set. It is decorated with a sequin gold tone brass charm and a tassel. Rose quartz promotes self-expression of feelings and promotes calmness. It allows to find inner peace and serenity. Snowflake Obsidian dissolves emotional blockages and we stabilized our moral convictions. It calms disturbed atmosphere and helps release us emotional blockages. This is the stone of balance.